HTC's new flagship Windows Phone—the 8X—is not just impressive because it packs a 1.5 GHz, dual-core Snapdragon S4 chipset and 4.3-inch 1280x720 display good for a PPI of 342. But it also manages to make a phone that, already checking in at a svelte 0.39-inches, feel even thinner than it is. Nokia Lumia 920, you have some competition. 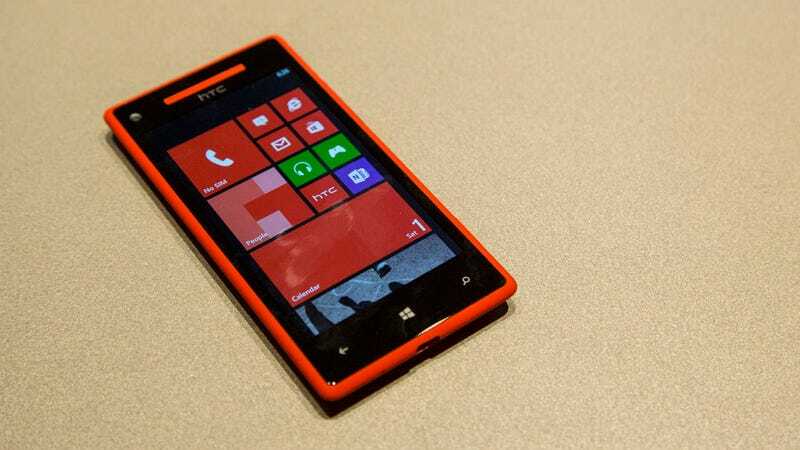 Nokia Lumia 920 Hands On: You Really Want This Thing—But Enough to Switch? The 8X keeps pace with the Lumia 920 in nearly every category, and even bests it in a few. It has LTE, a gig of RAM, an 8-megapixel rear camera (with dedicated button), a 2-megapixel front camera, 1080p video recording, NFC, and Beats Audio enhancement with an "enhanced" headphone amp (of course). The one major downside to the phone is that it's only available in a 16 gigabyte storage capacity, and has no expandable storage. And while it does have a slightly smaller, but comparable, 1800 mAh battery and a slightly smaller screen than the 4.5-inch Lumia 920, those may not end up being negatives if battery life is the same and you prefer a smaller screen. But what is this thing like in the real world? It's light. It's thin. The tapered edges of and soft-touch finish of the make the phone easy to hold, though you do feel the edges dig into your palm a little when you grip it. The screen is beautiful. Deep blacks, and eye-popping colors immediately impress upon first glance, especially with the Windows Phone 8 UI in front of you. And the combination of the screens responsiveness, the beefed-up processor, and OS improvements really make for an experience that's fast and fluid. But that's not the only phone HTC has in tow; the HTC 8S is the cheaper, smaller sibling to the 8X with specs that reflect that across the board. Whether its the 4-inch, 800x400 Super LCD, the 1 GHz Snapdragon S4 CPU, the 512 megabytes of RAM, lack of LTE, or the 5-megapixel camera (with no front cam), there's no room for debate as to which phone is better. The one plus is that because it only has 4 gigabytes of storage, HTC included a microSD slot for system expansion. But those looking for a cheap-ish Windows Phone could probably find worse.